Defense mechanisms represent an important component of medical education that should be taught to all medical students, psychiatry residents, and other mental health trainees. Teaching about defense mechanisms can become more engaging by analyzing popular media. Using Breaking Bad, a well-known television show, we recommend specific scenes and episodes that can be used in teaching about defense mechanisms. Brownfield, P. The Writers Guild of America, West. http://wga.org/content/default.aspx?id = 4857; Retrieved August 16, 2013. Burke MJ, Campbell C, Dunstone D, Lamdan R, Levine R, Roman B, Rosenthal R, Waterman S, Sierles F, Brodkey A. Clinical learning objectives guide for psychiatry education of medical students. 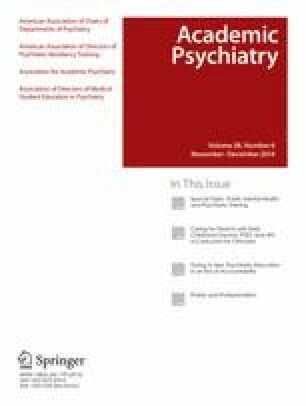 Association of Directors of Medical Student Education in Psychiatry (ADMSEP). http://www.admsep.org/Clinical_LO_Guide_Outline_Format_Nov_07.pdf. Retrieved March 13, 2014. Functions and structure of a medical school. Liaison Committee on Medical Education. June 2013. rhttps://www.lcme.org/publications.htm. Retrieved March 13, 2014.